Cornice and entablature are terms used to describe fancy decorative trim at the eave area of a house. Georgian, Italianate, French Colonial and Adam are subclasses of the Renaissance Classical style. One thing that inspectors must describe and report on under most inspection standards is the wall cladding material. A good concrete garage floor slab is usually at least three inches thick and has five inches of well-compacted gravel beneath it. A “Yankee” gutter is an L-shaped trough slipped under the shingles at the edge of the roof. It is sloped to drain water out of the low end. The top of the gravel in a window well should be 6 inches below the bottom of the window. The Exterior Course covers retaining walls, grounds, window wells, lot grading, driveways, patios, walkways, decks, balconies, stoops and steps, porches, railings, wall cladding, flashing trim, eaves, soffits, fascia, as well as exterior doors and windows. You will learn to describe the exterior wall covering and inspect all aspects of the exterior named above. 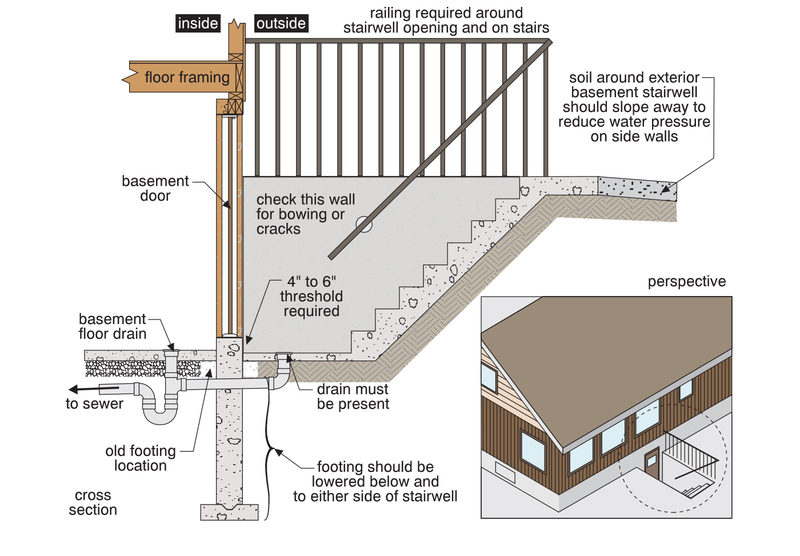 Lowered footings around basement walkouts — This illustration shows how foundation and footing systems can be built lower to account for greater frost depth. It is from our Exterior Course, Basement Walkouts Chapter. All of our 10 Courses are richly illustrated.